Georgia legislators and lobbyists recently gathered here in Savannah for a closed door meeting. But what was it really about and who paid for it all? That's something WXIA Atlanta Reporter Brendan Keefe set out to find out. We can't show you what's behind this closed door. A place where legislators and lobbyists have an equal vote – a place they don't want you to see. You need to be credentialed and registered. We are credentialed – we're Georgia media – are there legislators in there? Are laws being made in there? This isn't the state capital – it's a resort hotel in Savannah where legislators are wined and dined as part of American Legislative Exchange Council, or ALEC. "It's really a corporate bill mill, I mean they're cranking out legislation, putting it into the hands of legislators who go back and file it." Georgia Senator Nan Orrock would know. She was once a member of ALEC. What happens in these back rooms? There are votes taken that have the corporate votes at the same table with the legislators voting on which bills to pick, and that at it's core just screams out inappropriate. You're telling me that in these rooms – a corporation has an equal vote with a legislator on a piece of legislation? They absolutely vote and the truth be told – they write the bills. ALEC bills come complete with blanks where legislators need only fill in their state name – like the asbestos claims priority act – this Georgia law that now prevents many asbestos victims from suing corporations, matches the alec bill clause after clause – often word for word. The final vote was taken here at the Georgia capitol – but the bill was first approved here inside a las vegas casino at a closed door alec meeting. Records show the three Georgia senators who sponsored received more than 22-thousand dollars in alec scholarships to attend resort meetings the year before, during and after the asbestos law was passed. This is money from corporations to legislators, but it's being filtered through alec and they get a tax write off? Well Alec is a 501c3 organization – charitable purposes. That's right – alec is an educational charity – the signature of Georgia's speaker of the house – David Ralston, appears on this team alec fundraising letter – he writes your support of the scholarship fund is critical – enabling Georgia legislators to attend the annual meetings. Donations are 100-percent tax deductible and fund education efforts for legislators. Who's doing the educating? Inside that closed door committee room in Savannah we couldn't show you? We saw the lobbyist for the cellphone industry – seated across from Georgia State Rep. Ben Harmon – right before we were pulled out. We're credentialed to observe legislators here in Georgia wherever they meet to discuss laws…he's calling for backup. Alec staffers had four off-duty sheriff's deputies standing by while we talked with the group's director of communications. Can we do an interview with you? If you'd please turn the camera off. No – we can't turn the camera off – you know – that's one thing we don't do. Okay – well then I'd like to have you escorted out of the building please. Okay – I'm a guest of this hotel – I'm actually staying here at this hotel. You are staying at this hotel? 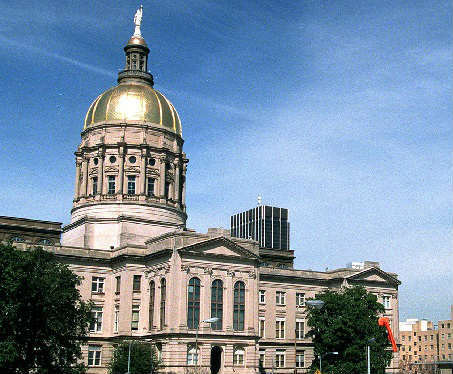 Yeah – so here's the question is – if Georgia legislators are meeting here – we're credentialed right here to see Georgia legislators making laws – are they discussing things that could become law here? Then why can't the people who elected them see the process? A private meeting paid for by whom? By our members and donors. Are you here for this conference too? We met two lobbyists and a state representative from New England the night before in the hotel bar and recorded our conversation. Do you have to pay your own way? Well – on a trip like this – and that's where you would come in maam – on a trip like this – I'm the state chair of alec and I look for financial supporters – lobbyists and the like to send us a couple thousand bucks every so often. That gives me money to help those folks with. And we pay more to be here so it helps support them. I see, so the lobbyist fees to come to the event actually help subsidize the legislator coming here. No – they're not lobbyists. The ones we recorded in the bar last night aren't lobbyists? He signals to the Sheriff's deputy. Did we violate some law or something? I mean, are we violating a law here? Don't say nothing. WXIA Reporters say they filed half a dozen open records requests with Georgia legislators including the speaker of the house – asking for receipts and reimbursements to alec events – but had their requests denied because the general assembly exempted themselves from the Georgia Open Records law. All photos by J.D. Willson unless otherwise noted. Details from the University of Georgia. The Beaufort County Sheriff's Office Marine Patrol and Dive Team and the South Carolina Department of Natural Resources are searching for a boater off of Daufuskie Island.According to a BeaufortCounty Sheriff's Office news release, a male boater who jumped into the water in the area of Daufuskie Island did not resurface. Stay with WSAV as more details become available. News 3 has confirmed that Sheriff Al Saint Lawrence will name an outside consultant to overhaul the Chatham County Detention Center. All content © Copyright 2000 - 2015 Media General Communications Holdings, LLC. A Media General Company.